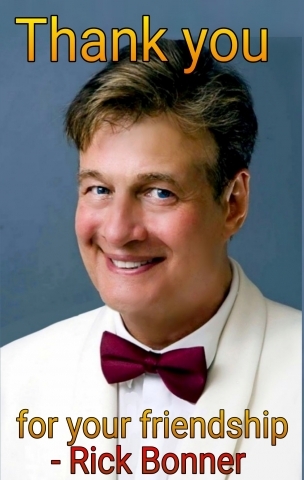 RICK BONNER is a charismatic and dynamic, vocal performer and entertainer. After a successful appearance on ITVs 'NEW FACES', Rick signed a management deal with showbiz impresario TONY LEWIS. From there RICK featured in over 60 MAJOR T.V. APPEARANCES and supported over 60 MAJOR INTERNATIONAL STARS, with successful live appearances at BIRMINGHAM HIPPODROME, LONDON INTERNATIONAL HILTON and aboard THE Q.E.II. After kicking off the RICK BONNER SHOW with FRANK SINATRA'S Jazz & Swing' (featuring RICK on both vocals and Tenor Saxophone). For 16 years, RICK performed around the UK as a featured cabaret for HAVEN, PONTINS, BUTLINS and BOURNE LEISURE holidays. Performing for many years at rhe highest levels. Working for many years at the highest levels. All round evperiencecas singervand entertainer working at the highest levels. After kicking off the RICK BONNER SHOW with FRANK SINATRA'S Jazz & Swing' (featuring RICK on both vocals and Tenor Saxophone), RICK breaks into a great mixture of contemporary 'Rock, Pop, Motown, Reggae, Soul and Disco Through The Years'.